Sixth Annual Great Duck Derby in Sebastian, Florida. SEBASTIAN – The weather was beautiful this weekend at Captain Hiram’s Sandbar where the Sixth Annual Great Duck Derby took place in the Indian River Lagoon. Approximately 4,150 ducks were adopted this year during the event, Colette M. Heid, Community Relations and Outreach Director of Treasure Coast Community Health, told Sebastian Daily. 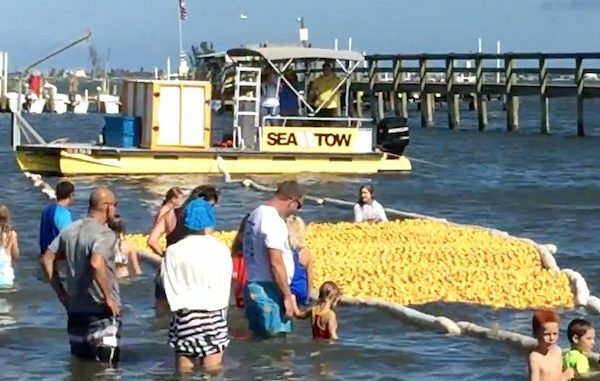 The Great Duck Derby started at 3:00 p.m. from a Sea Tow boat as children and families watched the yellow ducks make their way to the shoreline. A third place winner won a $250 prize, the second place winner won $500. 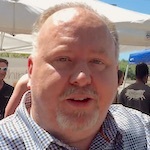 However, it was a company called Salt of the Earth who won the $1,000 prize for first place. The goal was to have 5,000 rubber ducks, meeting 83 percent of their goal so far with 4,150. All proceeds from the event go to Treasure Coast Community Health (TCCH), a non-profit organization that has been providing primary health care in Indian River County for over 20 years.